Last time I have shown how to employ ticking/unticking of checkboxes on Grid with AllowCellSelection = .F. via utilizing MouseDown event of Grid. So what makes this different than the first trick? The first trick relies on Relative Column of Grid. And this poses a problem when the columns are reordered via dragging into new position as Relative Column will then change. 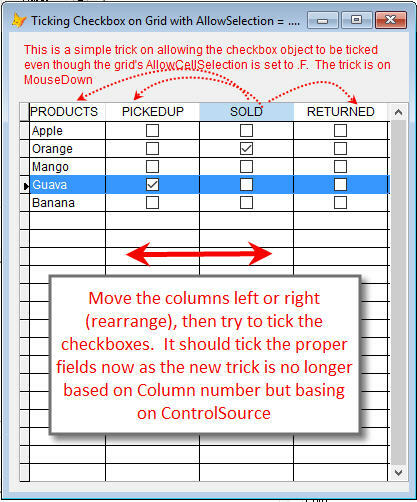 So it is not that foolproof and only will work when you don't rearrange the column orders. This one though fixes that as this is no longer based on the relative column's position but will be basing on the ControlSource of that column. I have added a WAIT WINDOW here so you can visually see that it does change the proper underlying field. Hope this comes useful to you! Cheers!